Zebpay is the best app to store, buy, and sell bitcoin in India. Zebpay bitcoin wallet is very user-friendly, safe and it can be used to convert bitcoins to Indian Rupee ₹ (INR) instantly according to the current market price equivalent to the United states dollar $ (USD). 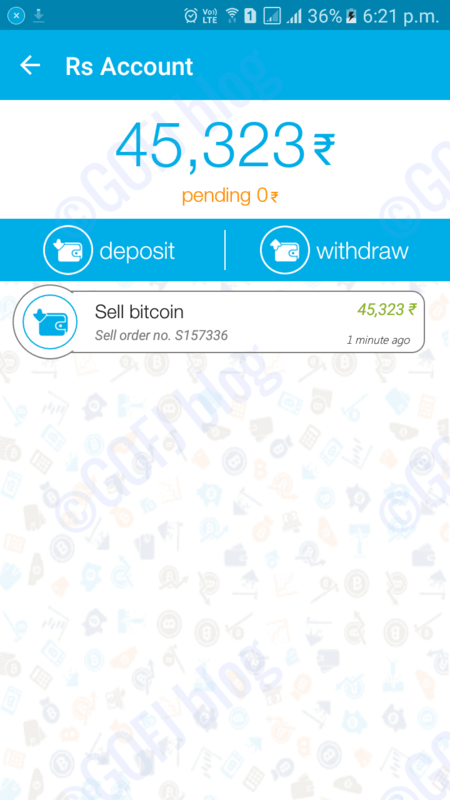 The sold bitcoins can be withdrawn to the local bank account from Zebpay account in one day. Also, Zebpay bitcoin wallet has features to buy, store, transfer bitcoin from one place and sell bitcoin for Indian currency, gift cards, etc. This article is the full review about the Zebpay where the features, usage, working procedure & the price value are explained in detail. 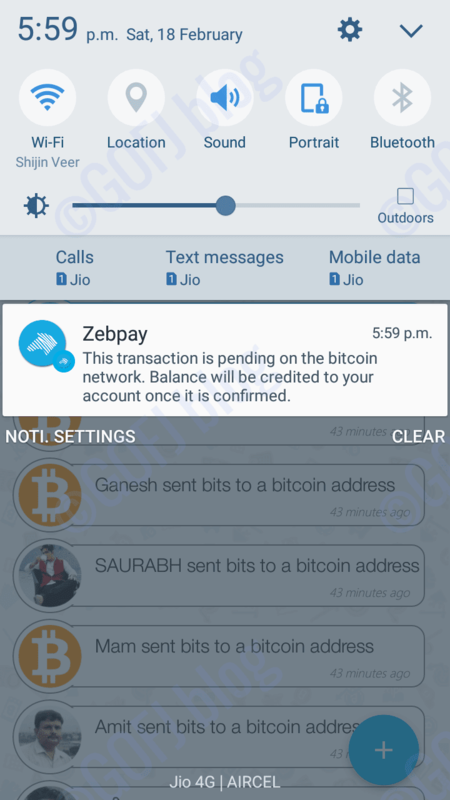 Zebpay is the first all in one bitcoin mobile wallet app in India started its journey on 2014. Zebpay is voted as the best, fastest and safest place to store, buy, sell bitcoins. Zebpay ensures that the customers get the best exchange price when they buy and sell bitcoins in their app. Zebpay is a mobile bitcoin wallet. After the verification, a bitcoin address will be assigned to the wallet. 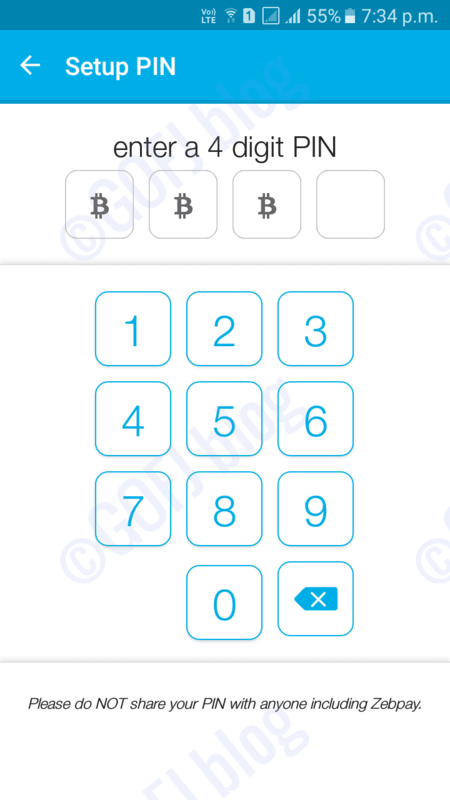 Zebpay users can use the assigned bitcoin wallet address to send and receive bitcoin. Zebpay users can receive/send bitcoins from/to other Zebpay users and also to the third party bitcoin users. Bitcoin faucet users and bitcoin PTC users can receive the earned bitcoins directly to the Zebpay bitcoin wallet instead of using the third party wallet/PC wallet. This will save time, transaction fees and help to accumulate all the bitcoins in one place. If you are looking to buy bitcoin, Zebpay allows you to buy bitcoin anytime using the money from your bank account. 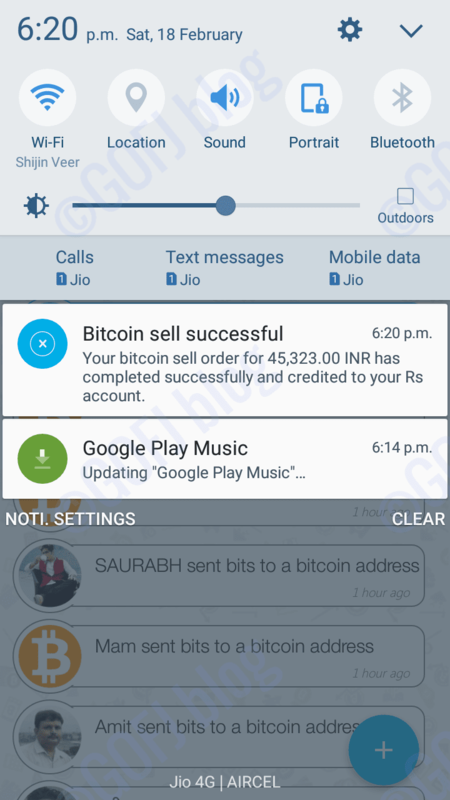 The accumulated bitcoin can be sold anytime for INR(₹). The Indian rupee will be stored on the Zebpay rupee account. On withdrawal request, the money will be deposited in the local bank account within one working day from the time of withdrawal request. 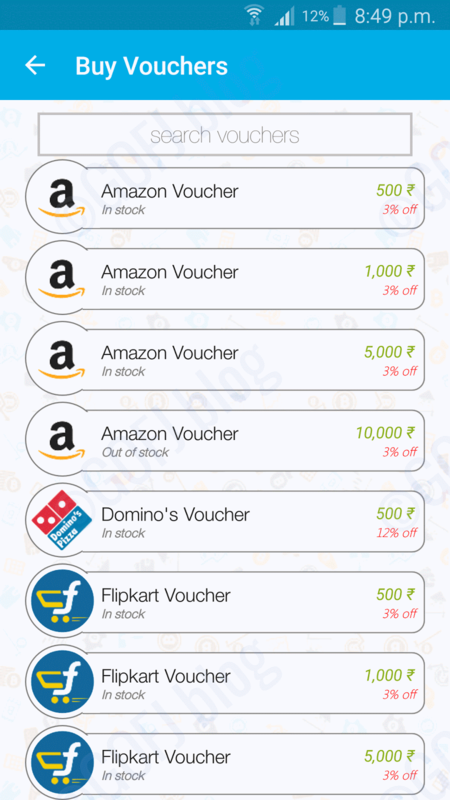 Zebpay users can use the bitcoins to purchase gift vouchers of companies like Amazon, Flipkart, Freecharge, Pizza Hut, Domino’s, UBER. 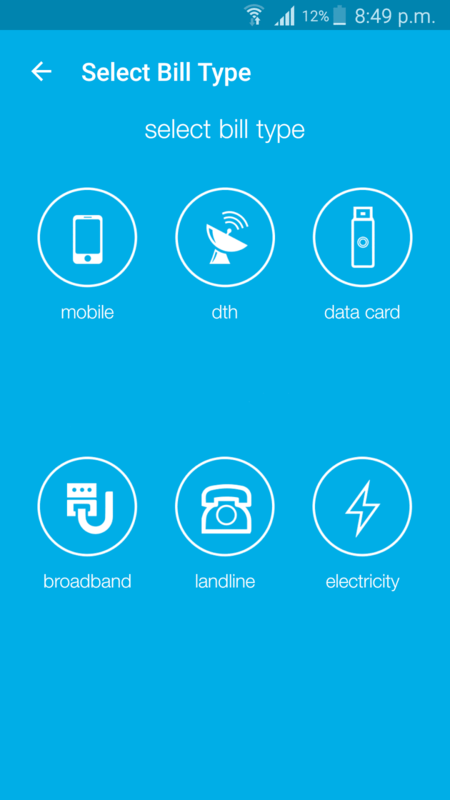 Also, the Zebpay users can use the bitcoin to recharge the mobile phone, DTH, data card and pay bills of broadband, landline, postpaid mobile, electricity and more. 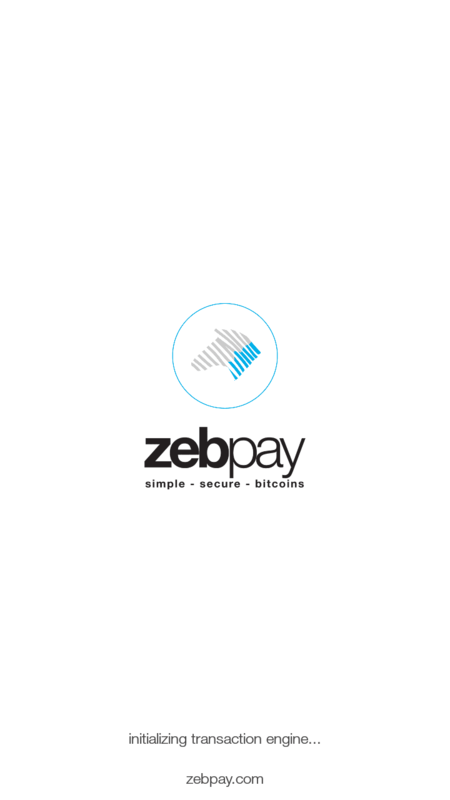 Zebpay allows its users to trade bitcoin by placing the bid. 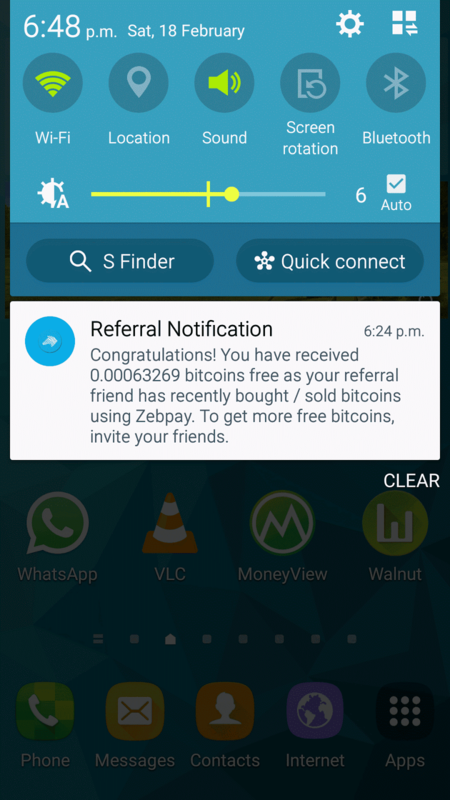 The referral program of Zebpay pay 0.10% referral commission when the referrals buy or sell bitcoin. You can refer your friends, colleagues to earn free bitcoins. Zebpay is available for two mobile platforms, the Android and IOS. This app may be soon released for the windows phone users. Go to the Playstore/AppStore and download the Zebpay wallet on your smartphone. Click on the icon to initialize the app and validate the device which might take a minute(s) to complete. 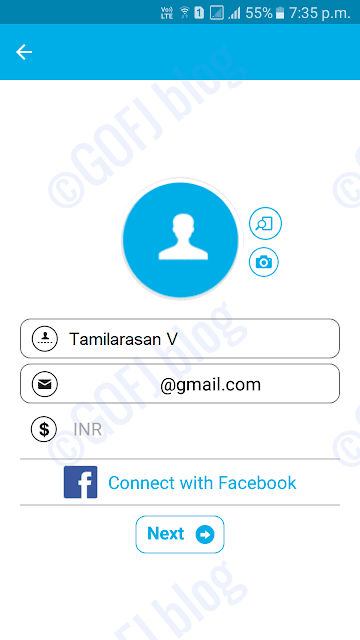 After the app completes the validating process, you must sign up using the email ID or through Facebook authorization. Register a new account using correct information. After sign up, you will be asked to verify your mobile phone number. Enter the mobile number and click verify. 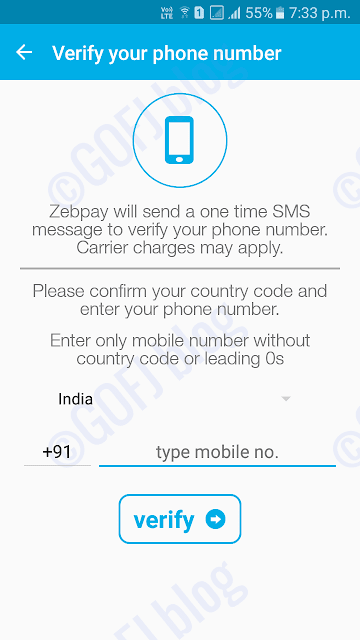 Now Zebpay will send a verification code to the mentioned mobile phone number through SMS. Enter the verification code to complete the mobile number verification process. 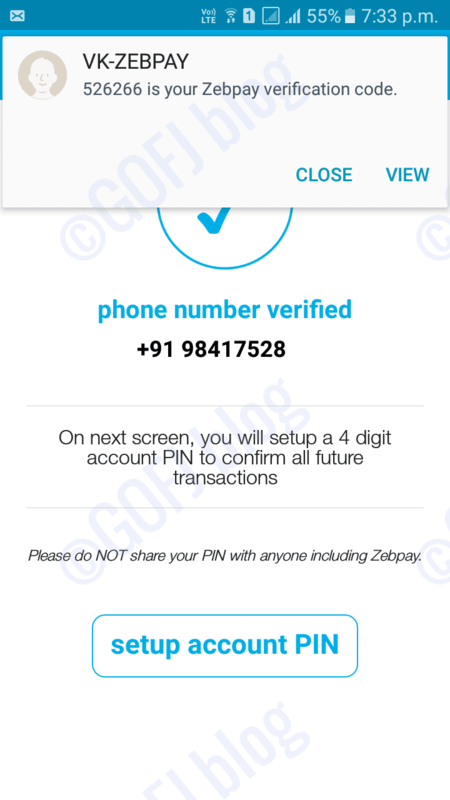 Now click on set account PIN to set the security PIN for the Zebpay app. You will have to set four digit PIN which will be required while processing transactions. The sign-up process and account verification process is complete. Now you can play around Zebpay dashboard and explore the features of Zebpay. After signing up and mobile phone number verification, you must verify the KYC. The KYC verification must be completed to buy or sell bitcoins on Zebpay. To start go to the account click verification in the menu, now the following page will load. 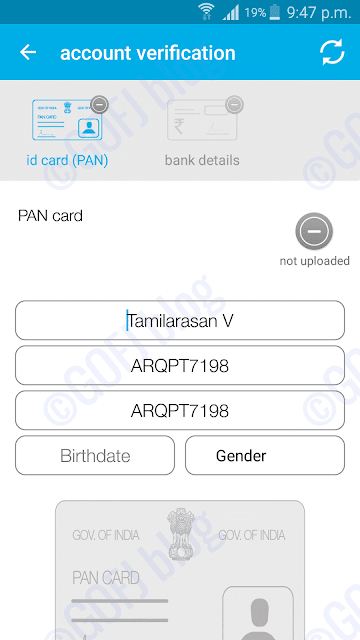 Enter your name exactly on the PAN card. Enter the PAN number, DOB, and the gender. Upload the scanned image of your PAN card and click submit. You will receive an approval mail and notification if the KYC details are approved. It will take up to one week to complete the verification process. You can submit your bank details at the same time to get approval. The bank account details must be approved to buy, sell and trade bitcoins. Enter the IFSC code of your branch. 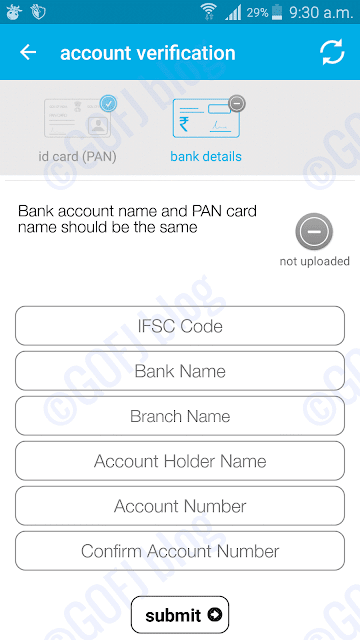 If you don’t know the IFSC code of your bank branch you can find them easily by searching on Google. Then enter the name of the bank (ex. Axis bank, HDFC bank, etc.) and the name of the branch. Enter your name on the “Account Holder Name” field. The name should match exactly as on the PAN card to get approved. Enter the account number and confirm it. Now click submit. Similar to KYC it might take up to one week to verify the bank account details. Simultaneous submission of PAN card and bank account details will speed up the process. Within the specified period, you will receive the approval/disapproval notification. If the details are approved, the blue tick mark will appear on the verification page as shown in the image given below. Now the KYC and the bank account verification is complete. 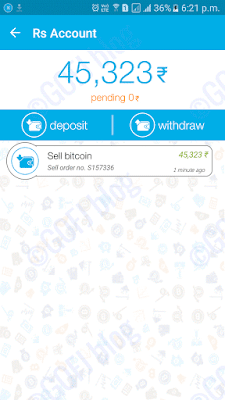 The account is now eligible to buy, sell and trade bitcoins. 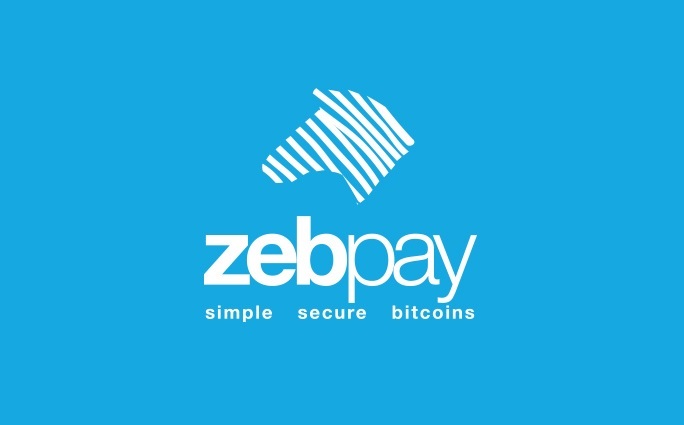 You can send and receive bitcoin using the Zebpay app. Bitcoins can be sent to the people in your mobile phone contact list or to the bitcoin address. Enter the correct bitcoin address to send bitcoin to the targeted user. As bitcoin transactions are irreversible, bitcoin will be lost if you send it to an incorrect address. To receive the bitcoin, you must go to the receive bitcoins section. 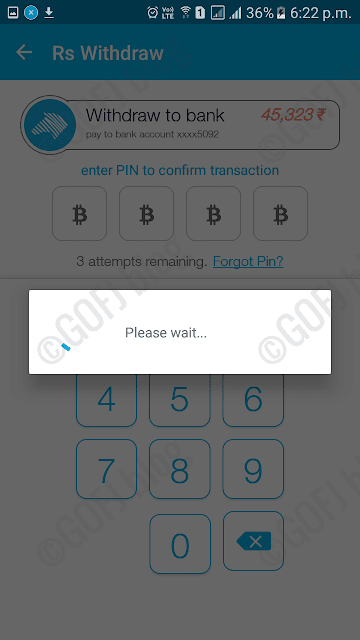 Wait for some time so that the bitcoin wallet address will be assigned for your Zebpay wallet. Copy the Zebpay bitcoin wallet address and send it to the bitcoin sender. After the bitcoins are transferred from the third party bitcoin wallet, it might take up to 5 hours to see the bitcoin in the Zebpay wallet. Internal transactions are instant. Buying bitcoin on the Zebpay bitcoin wallet app is pretty simple. In order to buy bitcoins, you must first deposit the money in the Zebpay account. 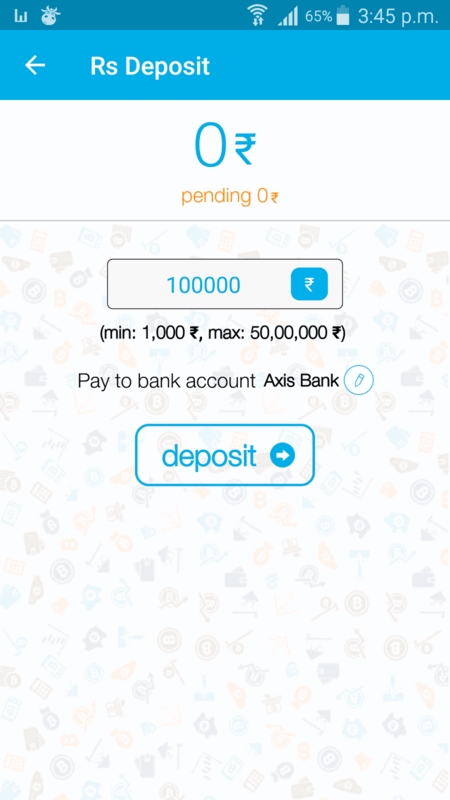 Money should be deposited/sent to the Zebpay bitcoin wallet only through the verified bank account. Zebpay will not accept payments from an unverified bank account. They might charge a penalty of ₹1000 as admin fee and refund the money back to the unverified bank account. To deposit go to Rs account or buy/sell page and click deposit. Enter the amount you wish to deposit. Select the bank in which you prefer to deposit. A deposit request will be created. Follow the instructions to complete the transaction. 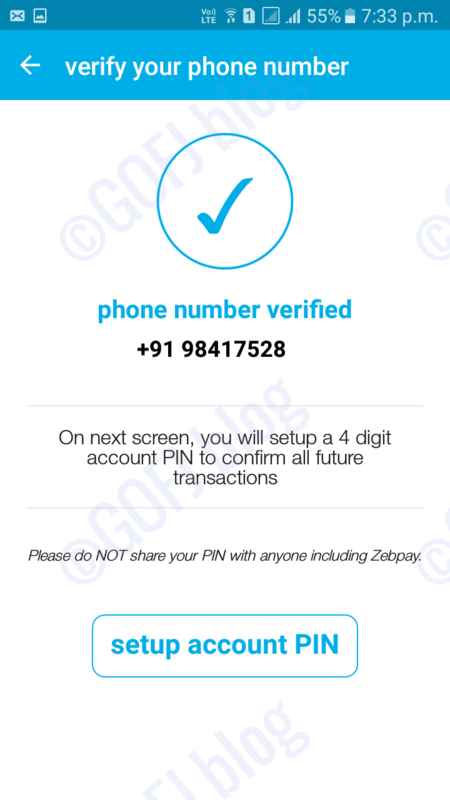 After the transaction is complete, send the reference number to the Zebpay. After the verification, the deposited amount will be added to the Zebpay Rs account. The INR can be sent to the Zebpay account using NEFT, RTGS or IMPS services. To buy click buy/sell bitcoin in the shortcuts. Under the buy bitcoin tab, enter the amount(>= the amount deposited on Zebpay Rs account) you would like to convert to bitcoins. The bitcoin value will be displayed below in bits. Click buy to complete the conversion process. The Indian currency will be debited from the Rs account and the bitcoin will be added to the Zebpay wallet. As I said earlier, Zebpay is the best, trusted source to sell bitcoin. Zebpay offers highest bitcoin price as possible equivalent to USD market price. To sell bitcoins, you must have at least ₹1000 worth bitcoin in the Zebpay bitcoin wallet. You can sell up to a maximum of ₹500000 worth bitcoins in a single transaction, ₹2000000 worth bitcoins day and up to ₹10000000 worth bitcoins per day. If you don’t have bitcoin, you can buy the bitcoin by following the instructions given above. To sell bitcoins go to buy/sell bitcoin page and click on sell bitcoin tab. Enter the amount of bitcoin you wish to sell in bits/INR or click sell all bitcoins if you wish to sell the entire bitcoins accumulated in the wallet. 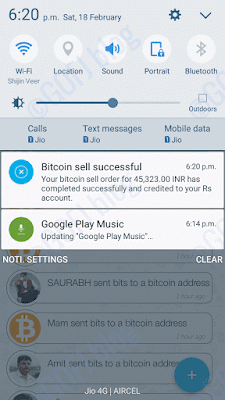 Click sell to convert bitcoin to INR. 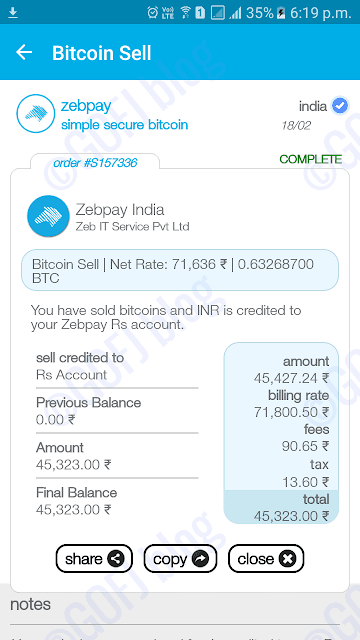 Now the sold bitcoin will be debited and the INR will be added to the Zebpay Rs account. 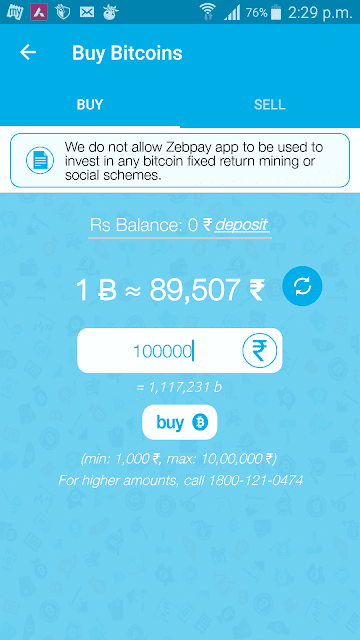 Now the Indian rupee will remain in the Zebpay bitcoin wallet Rs account until it is withdrawn. To withdraw the amount, go to the Rs account and click the withdraw tab. 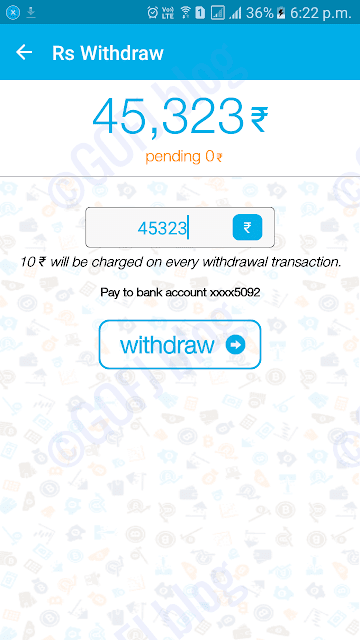 Enter the amount in INR you wish to withdraw and click withdraw. ₹10 will be charged for each withdrawal transaction. Enter the PIN assigned to confirm the withdrawal. Now the withdraw order will be created and the process will be completed within 1 business day. Zebpay will deposit the withdrawn amount in the verified bank account. They will send an SMS after the transaction completes. After receiving the notification, you can find the amount withdrawn in the verified bank account. If you didn’t receive the withdrawn INR in the bank account within one day it can be one of the following reasons. The withdrawal request has been made on the non-working day, Zebpay rejected the withdraw request, the bank account has not been verified, the bank rejected the payment. In such cases check the RS account in the Zebpay app and contact the customer service. 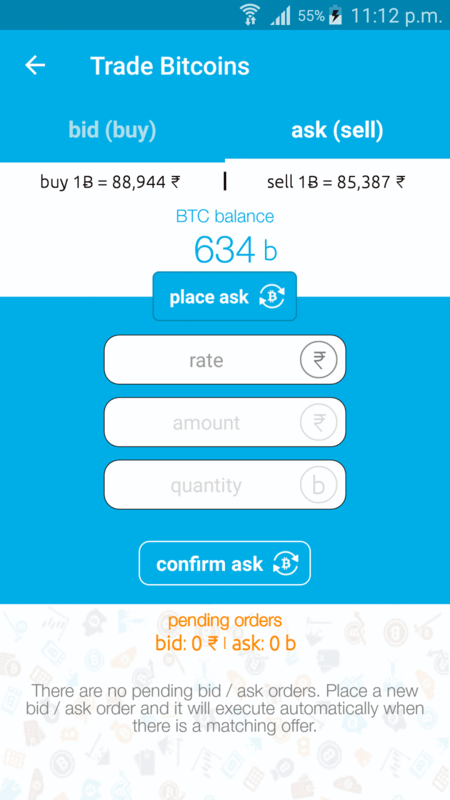 Zebpay users not only can convert the bitcoins to INR. Through Zebpay, the users can buy gift vouchers on discount price, recharge their mobile phone, data card, DTH using bitcoin and it has features to pay bills of broadband connection, Electricity, landline etc. In future, more such features will be added on Zebpay. To recharge, pay bills click the submenu button and select the service to pay using bitcoin. Zebpay sells gift vouchers on discount price. Users can by the gift cards using the bitcoins. Amazon, Flipkart, Domino, Pizza Hut, Freecharge, UBER gift cards are some of the gift vouchers found on the Zebpay gift vouchers menu. Zebpay allows its users to trade bitcoin by placing the bid to buy bitcoin and ask to sell bitcoin. The Zebpay users can make a marginal profit by trading bitcoins. Related article – How to invest bitcoins. The Zebpay referral program helps the Zebpay users to earn free bitcoins by referring their friends, family members, colleagues. 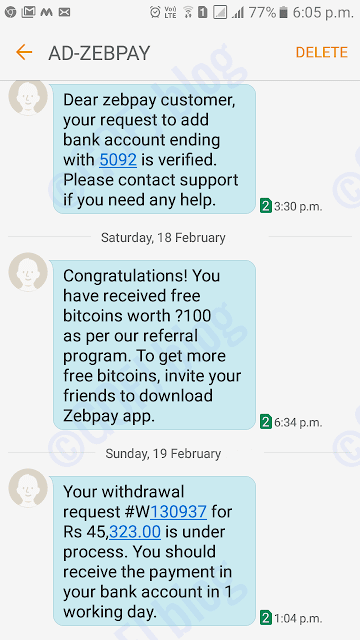 Zebpay pays 0.10% referral commission when the referral buys or sells bitcoin through their app. By referring more members, the referrer can earn more bitcoins for free. The rate of bitcoin is highly volatile. The bitcoin users can make use of this opportunity to make a huge profit by buying and selling bitcoin at the right time. This is what we do it on Gold and real estate. Profit – ₹110000 – ₹100000 = ₹100000. And bitcoin rate might even decline instead of increasing. Only do it after analyzing the market value of bitcoin for past three months using rate chart given on the Zebpay bitcoin wallet. There are risks of losing money if you sell bitcoins when the bitcoin price Zebpay goes below the purchase value. 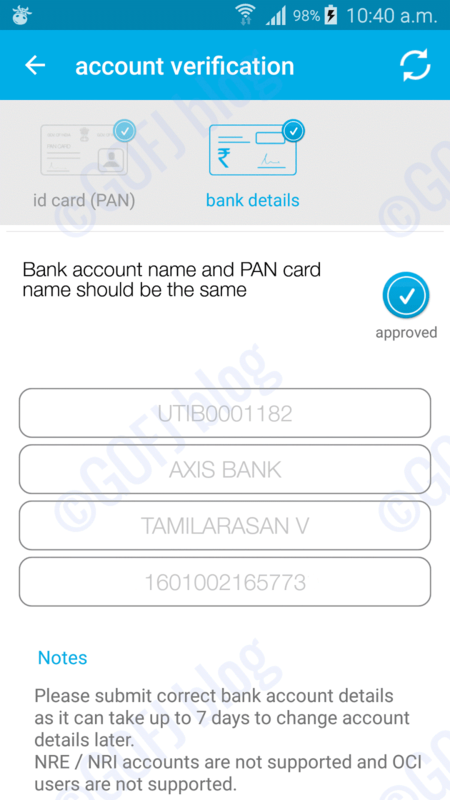 To use the Zebpay bitcoin wallet India, the user must have a PAN card and a bank account. 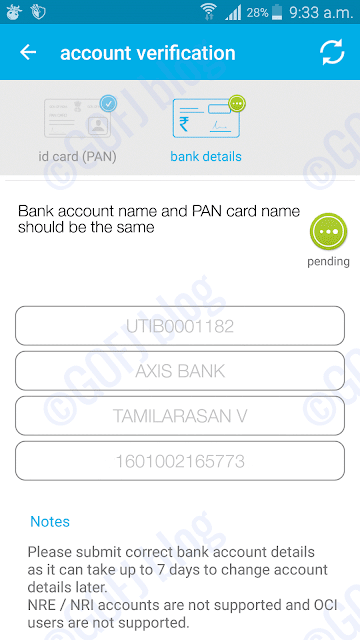 The name in PAN card and the bank account should match. There is a transaction limit for the Zebpay users they can make per transaction, per day and per month. Zebpay users can transact only a minimum of ₹1000 per transaction and maximum of ₹10000000 per month. 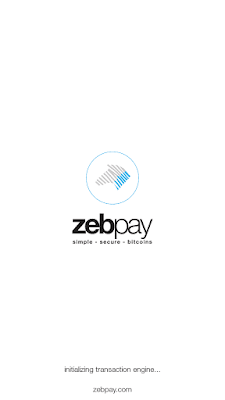 In the case of bitcoin transactions, the Zebpay users can send/receive only 20000 satoshis or more per transaction. Zebpay users cannot store INR in the Rs account for more than 3 months without making any transactions. Any such amount will be immediately deposited in the verified bank account after 3 months of inactivity. Also, during the end of the March, the INR in the Zebpay accounts will be automatically deposited in the verified bank account. 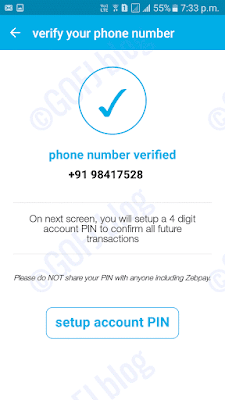 So, as a Zebpay bitcoin wallet India user, you must plan ahead to prevent unnecessary automatic transactions. Zebpay does not allow the users to deposit INR from the unverified bank account. If the INR is deposited from the unverified bank account, the payment will not be accepted by the Zebpay and the payment will be sent to the bank account with ₹1000 fine deduction. Zebpay bitcoin wallet app is an user-friendly mobile app that helps the Indian users to enjoy the instant cashless financial transactions. Unlike cash transactions, bitcoins can be received/sent to anyone in the world in a second. Zebpay wallet is the most trusted, safest place to store bitcoin for free of cost. No transaction fees will be charged in Zebpay wallet to send/receive bitcoin. Zebpay has the features to sell, buy, trade bitcoins in one place. If you wish to sell bitcoin immediately when there is a bitcoin price hike, it can be done within few minutes. Zebpay will send notifications to the users when there is a change in the bitcoin rates. Zebpay bitcoin price is very high compared to other bitcoin exchange sites. 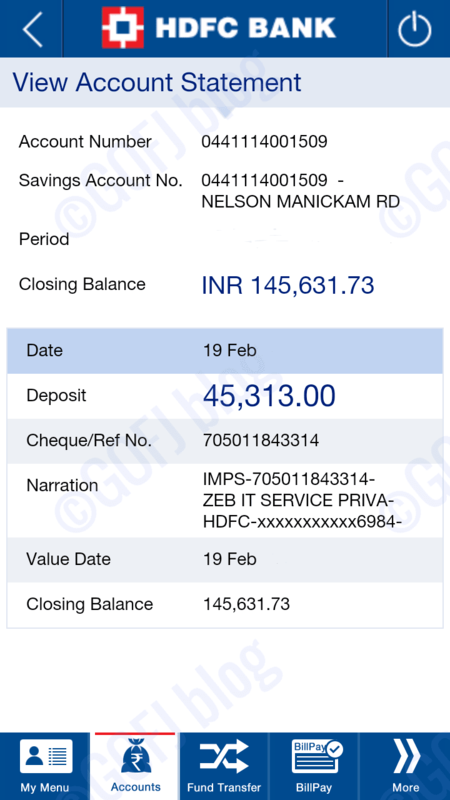 Zebpay helps the users to convert bitcoin to INR instantly and transfer it to the local Indian bank account within one working day. Apart from cash transactions, Zebpay users can buy gift vouchers, recharge their mobile phone, data cards, DTH, pay bills using the bitcoins. Zebpay can be used to make profits by analyzing the bitcoin price. This is a great side business to make the profit. Even though bitcoin is a non-centralized currency which is not controlled by the government, Zebpay users must abide by the rules of IT department to use Zebpay bitcoin wallet. Since the Indian users submit their KYC details to Zebpay, all the transactions will be monitored by the Indian Government. Zebpay users must pay tax if they make transactions, profit above minimum tax exemption limit. The bitcoin price changes every second, unexperienced bitcoin users have the risk of losing their money by selling the bitcoin below the purchase rate. If you’re a new bitcoin user, read this article – What is bitcoin? Earn free bitcoin – Bitcoin faucets, Bitcoin PTC.